The “Eurasian Landbridge” or New Silk Road — a vision first proposed and drafted by Lyndon and Helga LaRouche over two decades ago to fully develop the entirety of the Eurasian continent — is now the active, official policy of the government of China, supported also by other key Asian nations. On September 7, 2013, Chinese President Xi Jingping visited Kazakhstan where he first announced the adoption of a policy he called the “New Silk Road Economic Belt” stretching from the Pacific Ocean to the Baltic Sea. 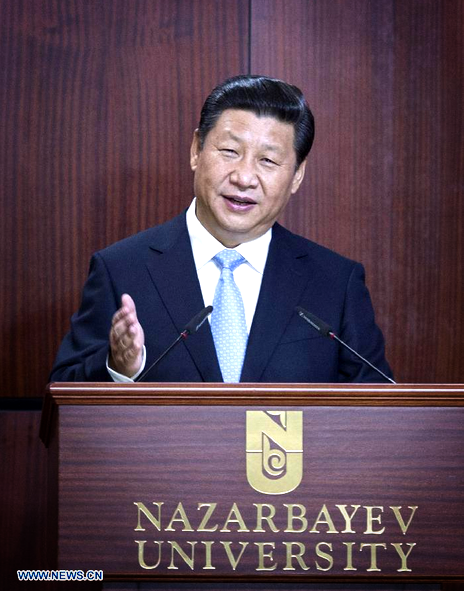 Chinese President Xi Jingping speaking in Astana, Kazakhstan on September 7, 2013 announces his poilicy of creating a Silk Road Economic Belt for the development of Eurasia to deepen cooperation and forge closer economic ties among the nations. Less than a month later, President Xi Jingping augmented his program for the Silk Road Economic Belt by also calling for the creation of a ‘Maritime Silk Road of the 21st Century’ during a speech in Indonesia. 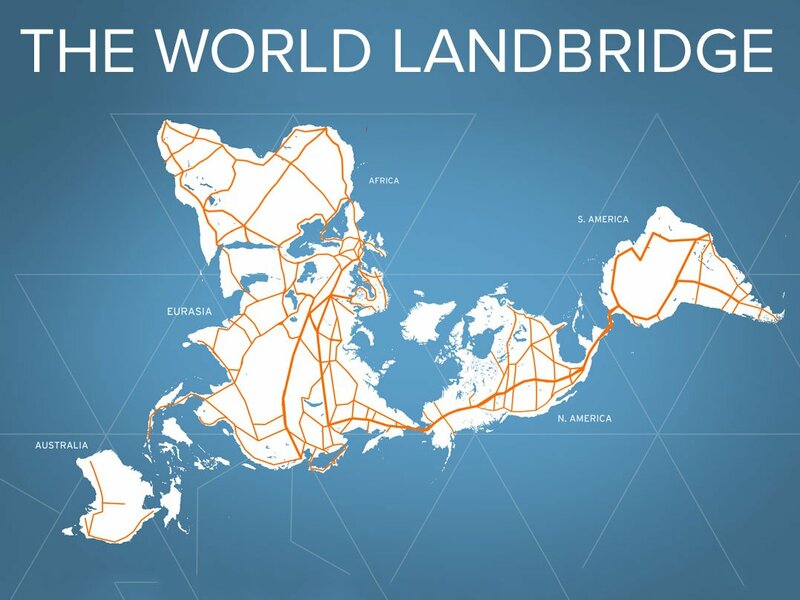 Below, we present an interactive map of the World Landbridge, an extended version of the Eurasian Landbridge plan for the economic development of the entire planet. This planetary development program — an integrated system of the most crucial projects in transportation, water management, power generation, resource development, agricultural production, and city building — will be the cornerstone of a new international system of common benefit among nations for mutual cooperation and progress, a new system which is already emerging with the historic agreements for a new international economic order among the BRICS nations and others. This video introduces a few key infrastructure projects for Africa. In this part of "The World Landbridge", Jacques Cheminade discusses the Transaqua Project for not only refilling Lake Chad to its 1964 water levels, but for revitalizing and developing the whole region. A presentation on the Grand Millennium Dam by Mulugeta Zewdie Michael, Consul General of Ethiopia, at the International Schiller Institute conference held in Frankfurt, Germany, on November 24-25, 2012. A presentation by Aiman Rsheed, an Egyptian engineer, on the Africa Pass project, at the International Schiller Institute conference in Germany, November 24-25, 2012. The Oasis Plan was presented by Lyndon LaRouche to leaders of Southwest Asia, Arab as well as Israelis, as a basis for peace based on economic development already in the first half of the 1970s. This idea not only brings economic development to the nations of the region, but also peace to this very sensitive part of the world strategic situation. The current global strategic situation can be defined as a fight between two systems: a dying Trans-Atlantic system in its death throes, which seeks to destroy and loot a Eurasian system which has begun to commit itself to true principles of progress, outlined in this video. Following the release of "Nuclear NAWAPA XXI: Gateway to the Fusion Economy," in this video we explore a featured case study from that report in more depth: the proposal to build a Kra Canal across Thailand, a good candidate for construction using peaceful nuclear explosions. This is a real "Asia Pivot," typifying the concept of peace through development, contrary to the Obama Administration policy in the region. This article is a part of a package of articles, published by 21st Century Science and Technology Magazine, on the perspective for mankind's coming four generations. This article details the extended Pacific Basin development projects — from NAWAPA XXI, across the Bering Straits, to rail and nuclear development in Southeast Asia — viewed as a single, integrated program of voluntary upward evolution. Hussein Askary, Chairman of EAP Sweden, presented a new development plan for the Near and Middle East at an International Schiller Institute conference on November 24-25, 2012. A discussion of the implications for the USA's NAWAPA project for greater Eurasia. "Implementing NAWAPA in the United States can catalyze a planet-wide era of biospheric engineering. A project similar in principle to NAWAPA for Central Asia, referenced by Helga Zepp-LaRouche, is the central case study presented here." A presentaiton by Pakdee Tanapura, international director of Thai Kra Canal Project, at the Schiller Institute International Conference. Any planetary recovery must necessarily begin by examining the economic principles which underlie the difference between a successful and unsuccessful economic policy. In particular, we must first elaborate the characteristics of a self-developing system -- one whose evolution is entirely governed by its internal relations, not subject to any fixed outside metric. Then we will look at the case of Russia, where it stands now, and the where the current proposal for Arctic development fits within a self-developing system. The Oasis Plan was presented by Lyndon LaRouche to leaders of Southwest Asia, Arab as well as Israelis, as a basis for peace based on economic development already in the first half of the 1970s. Vostochny Cosmodrome, a new science city, with research centers, an academy for young scientists, an astronaut training center, and space manufacturing facilities. The project would be key to repopulating Siberia and the Russian Far East. Here we present another extension of the global NAWAPA program and the completion of the world land bridge: the bridging of the Darien Gap between Panama and Colombia, and the development of economic platforms for South America more generally. This particular project has been under attack by the British Empire's lackeys for most of the 20th century; similar to the Bering Strait connection, it represents a potentially unique economic singularity which they wish to suppress. The development of large land-areas must be based on a crash program, establishing a sufficient density of basic economic infrastructure. The routes on the map of the World Landbridge are development corridors: about 100 km wide zones with high-speed transportation, roads and railway lines, canals and water management systems, irrigation, power generation and distribution based on the new generation of nuclear power plants, fuel pipelines, fiber optic cables, new agricultural and industrial zones with mining and manufacturing of goods, and new cities and universities. NAWAPA XXI requires an intensification of productive output, more important than quantitatively, qualitatively. This will be achieved by applying a more powerful principle across the board, from raw material extraction, to the processing of the end product. The horizon which guides us today is fusion. Let the achievement of an economy based on the principle of fusion drive our transition, now, into an economy built on fission. Released on Thanksgiving 2011, NAWAPA 1964 is an LPACTV documentary. This is the true story of the fight for NAWAPA, spanning the 60s and early 70s, told through the words of Utah Senator Frank Moss. Twenty-five years ago, on November 9, 1989, the former Soviet system crumbled, posing a vast opportunity to mankind for the integration of Europe and Asia. One year earlier, at an historic speech in West Berlin, Lyndon LaRouche had foreseen the crisis and had proposed “a kind of Marshall Plan” for the rapid industrialization and modernization of the former Soviet-bloc countries of Eastern and Central Europe. With the fall of the Berlin Wall, Lyndon and Helga LaRouche immediately moved to put this plan into action, proposing to use the modernization of Eastern Europe as the “locomotive” for the economic development of Eurasia. The concept takes the form of the “Productive Triangle” linking together Paris, Berlin, and Vienna through high-speed rail, thus creating an integrated high-density 320,000 square-kilometer industrial development zone, spiraling out into eastern Europe via transport, energy, and communication development corridors. LaRouche elaborates the proposal in a policy paper composed the following year, “The Economic Development of Eastern Europe,” proposing that such a development driver be the cornerstone of a new, more just international economic order to replace the equally bankrupt and decayed Western free market system. Following the official dissolution of the Soviet Union the following year, Lyndon LaRouche expands the concept of the ‘Productive Triangle’ to include the former Soviet territories in Russia and central Asia, and stretching all the way to the Pacific coast of China and Russia. This proposal, which becomes known as the ‘Eurasian Landbridge,’ concentrates on three ‘development corridors’ spanning the Eurasian continent: a northern route via the Trans-Siberian Railroad to Vladivostok; a central route through Ukraine, Russia, Kazakhstan, and China; and a southern route from Western Europe through Turkey and Iran into Central Asia and ultimately on to China. This plan would economically integrate the Eurasian continent, maximizing the productive potential of its territory and peoples for the common benefit of all, and resolving the artificially imposed strategic divisions among the great powers through the promotion of development in their mutual interest. Executive Intelligence Review magazine publishes a feature-length study elaborating this “integrated Eurasian development network stretching from the Atlantic to the Pacific,” stressing that it will serve as the centerpiece and foundation for creating “an alliance of nations committed to a common programmatic perspective for establishing a just world economic order.” This new economic and monetary order would be comprised of a “community of interest among sovereign nations committed to rapid economic development” to replace the failed financial systems of both East and West, bridging the rich and diverse cultures of the Eurasian continent and ending the legacy of the geopolitical “Great Game” policy of perpetual war. Over the coming fifteen years, the LaRouche movement would sponsor literally thousands of seminars, conferences, meetings, discussions, lectures, and other events to promote the idea of a new economic and strategic order for the planet, keystoned by the integration of the Eurasian continent through the development of the Landbridge.